It has been a while since I last showed my work. Life got in the way of doing what I loved, and it took a toll. I am so thankful to have been able to step back and take some time to remember the things I love and what makes me happy. Painting makes me happy. Nature makes me happy. Thank you to Land of a Thousand Hills for letting me get back on the bike and share my work. I remember painting a skull in high school and being proud of how it turned out. I still have the piece and although it is not good by any measure of talent that I am aware of, it did teach me something. I learned that I love odd things, odd art, and not the traditional "beautiful images". I collect odd things. I have little bones I have found while out hiking, dead insects behind glass, egg cases that were washed up on the beach, and seed pods, oothecas, all the odd and beautiful items of nature. 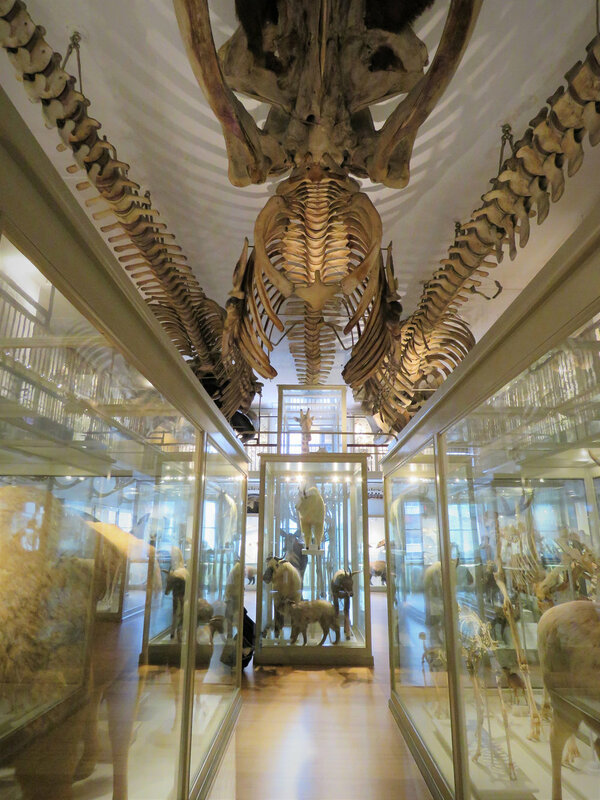 The trip to the Harvard Museum of Natural History has proven to be a source of inspiration for my latest works. I loved the shadows, the bones, the washed out color and austere look of the displays. I love everything in a row, lines of the same item over and over. Squared off images. The photograph that I took that inspired the painting. I changed the yellow tones to blue and altered some areas to be more appealing to my eye. 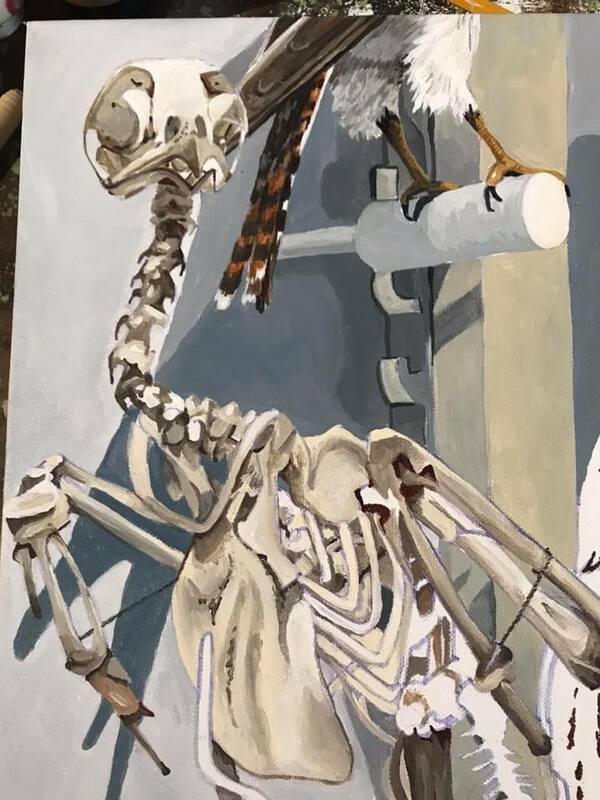 Painting the Barred Forest Falcon skeleton was a challenge. I have never done more than a skull before and there were so many moving parts and shadows. I used creative license in some areas to push the shadow or highlight, but overall I am proud of how this one turned out. Lets hope in 20 years I am not looking back and wondering what I was thinking. Museums provide me with such joy and can spark inspiration in so many ways. This weekend was about reconnecting to ART, knowledge, and getting the creative juices flowing. Massachusetts is home to so many special places to expand your mind and to make you see things in a different light. We explored Salem's amazing public art and the Peabody Essex Museum which was running a Georgia O'Keefe exhibit highlighting her clothing and personal style. Seeing how she styled her outward appearance as well as her art was fascinating. We also made a trip to the Harvard Museum of Natural History. I remember visiting here for a class field trip (many, many years ago). Although many of the rooms were still the same, I still got that feeling of excitement walking around the corner, of the anticipation and hope of what hidden gem we will find. It should be no shock that cabinet of curiosities have been an inspiration in my work, and something I enjoy greatly. The articulated skeletons, the variety of taxidermy, AMAZING glass botanical examples are all worth the trip. Glass flowers in the Harvard Museum of Natural History. Mountain Laurel and a beautiful example of artistic craftsmanship. Exploration of Native and Non-native Species from Canada to Connecticut was showing at GFDC in Turners Falls, MA. I loved all the research and exploration that went into these works. I tried to show the beauty in the native plants and animals and the consequences of the non-natives. This piece explores the various stages of the Monarch Butterfly (Danaus plexippus) and the importance of milkweed in their reproduction. Monarchs lay their eggs on the milkweed plant, and the caterpillars survive on the plant until they are ready to form their cocoons. Most this is what ultimately gives monarch butterflies their unpleasant taste. Monarch and Swamp Milkweed (Asclepias incarnata) are both native to New England and can be commonly found. I have always loved to paint. But painting has always only been one of my loves. I grew up in the woods, surrounded by the beauty of nature. Everywhere I looked there were plants and animals, each amazing in its own way. Plants have always been an inspiration to me. From the radiant beauty of tulips just after they bud in spring, to the tragic, muted browns of a fallen leaf at the approach of winter, nothing reveals the wonderful cycle of life as much as the flora that lies all around us. Another of my passions was for the animals that lived nestled among the plants I saw everywhere. The green of a mantis, hiding among the leaves; the iridescent colors shining off the shells of a jeweled beetle; the glistening hues of feathers—nothing could be more beautiful or varied than the colors that are to be found throughout the ranks of the natural world. When I went off to college in Iowa, I chose a path that combined my love of art with my love of the hidden treasures around me and majored in Anthropology focusing on the Mesoamerican world. To this day, I often use my college study skills when starting a painting. I begin by learning as much as I can, fully researching my subject in print and in the field if possible. I am still fascinated by religion or mythology, and occasionally create pieces based on these subjects. Being landlocked in Iowa also created a longing for the varied landscapes to be found in my native New England. Moving back “home” reconnected me with the beauties of nature, and inspired a new interest in photography. I love few things more than hiking with my husband through the woods and taking pictures of everything I see—the flowers below, the trees around me, the skies above.